Authors are inspired by many things. For me, it can be the odd article in the newspaper or online, an overheard conversation in a restaurant, people watching at the mall, a song — well, almost anything can give me an idea about a plot or a character. But many authors have one author or even one book that inspired them to write, influenced what they wrote. Several years ago, I was asked to contribute an essay about my muse for an anthology. The anthology was called Mystery Muses: 100 Classics That Inspire Today’s Mystery Writers, edited by Jim Huang and Austin Lugar (Crum Creek Press, 2006). The book won an Anthony Award for best critical work, awarded at the annual meeting of the World Mystery Writers, Bouchercon. To preview the upcoming Bouchercon in Cleveland in October, I asked my fellow panelists on the Murder, Mayhem, and the Mattress Mambo panel (or as we like to call it the “I Used to Love Her, But Had to Kill Her” panel) to write an essay on which author or book inspired them to write. Each Wednesday in September, I will post one of these essays. What amazes me, now that I also write novels, is that the set up in The Moon Spinners is done so effortlessly and in less than two chapters. There are no wasted words or lines in a Mary Stewart book. Just as the fabled Moon Spinners spin the moon, Ms. Stewart spins her story, effortlessly and inexorably pulling in her reader. For me, other than the amazing settings and sense of place, it is her ability to create an atmosphere that holds you breathlessly in its thrall from her novels’ first words until the last. Her usage of words rivals a poet’s. 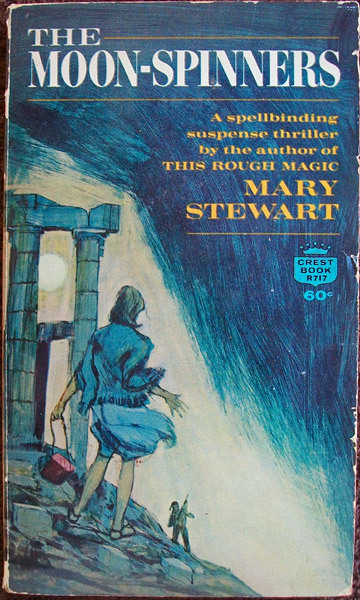 No doubt about it: Mary Stewart is a master wordsmith. Added to her perfect selection of words is a superb sense of pacing. Each word, each line of text builds upon its predecessor, building tension and providing relief, only to escalate again until the final climactic scene. Her plots are a perfect balance of description, suspense, and romance and as seamless as a Mobius strip. This is why myself and a whole generation of authors has attempted to emulate Mary Stewart’s style. ~ by Monette Michaels on August 29, 2012.